Maverick Coaches are encouraged to attend a Level 1 Coaching Workshop for the Beach, the weekend of June 7-8 from 9am - 5pm at St. Paul's HS on Draper Ave. in Ottawa. 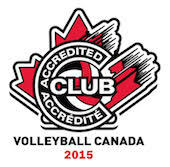 Registration can be found at http://www.ontariovolleyball.org/events/volleyball-1-workshop-ottawa. The workshop will be led by Steve Leknois, Head Coach of the Men's Volleyball Team at Royal Military College. Coaches who complete the Level 1 Certification will be given priority for coaching positions with Maverick Youth Summer Beach Programs.